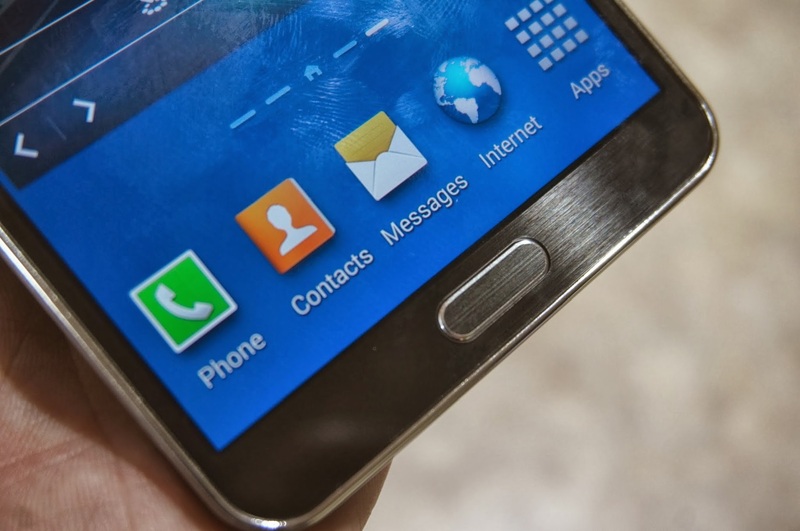 Galaxy Note 3 review: To ink or not to ink? That is the question. Samsung’s Galaxy Note 3 arrives in stores this Friday, where customers can decide if the large handset with digital inking is worth the purchase. Now in its third iteration, the Galaxy Note line has defined the category of a stylus-enabled phone. Based on using a Note 3 for the past week, it’s surely better than its predecessors, but will it and its $299 (with contract) price appeal to a widespread audience? Make no mistake about it: The 5.7-inch display makes the Note 3 a large phone, measuring in at 151.2 x 79.2 x 8.3 millimeters (5.95 x 3.12 x 0.33 inches). 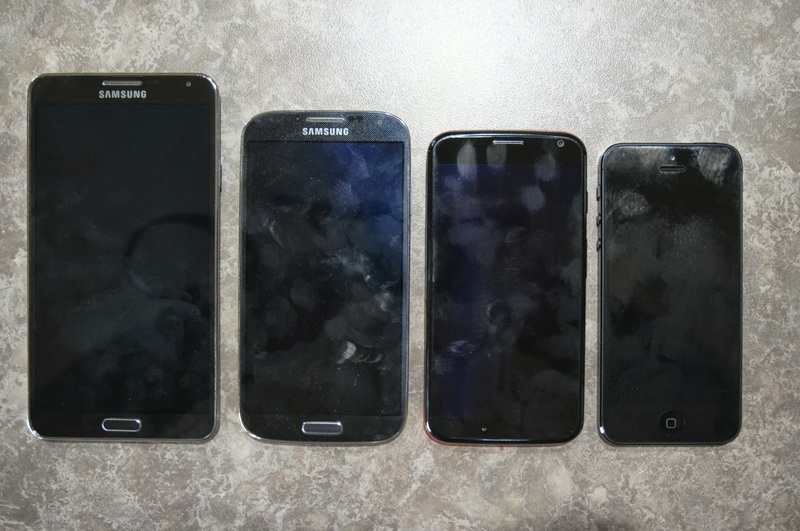 Here’s a size comparison of the Note 3 with a Galaxy S 4, Moto X and iPhone(s aapl) 5. Like the Galaxy S4, however, Samsung has done a great job fitting a big screen into as little a phone as possible; there’s very little bezel around the display. You won’t be looking at bezel anyway: the 1080p display is crisp and vibrant, offing a pixel density of 386 pixels per inch. Like many of Samsung’s Super AMOLED screens, the color saturation may be a bit much for some, however. The phone’s design isn’t inspiring; it’s basically the same general look as the Galaxy S 4 with more rectangular but curved corners. 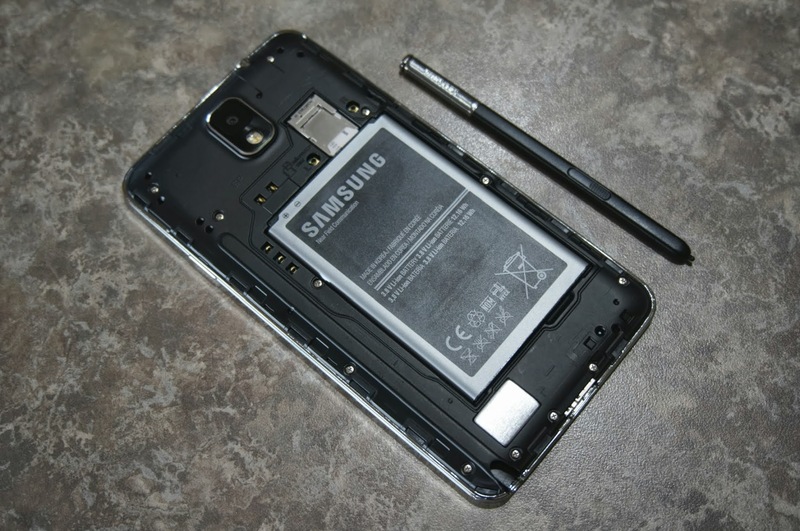 Samsung did improve on the removable back cover though. Yes, it’s still plastic but has more grip thanks to a leather-looking embossment. Button layout is typical for Samsung as well: power on the right, volume rocker on the left and a hardware home button below the display. Capacitive buttons on each side of the hardware home button are for menu and back presses. Samsung moved the back speaker to the bottom of the phone next to a new USB 3.0 jack. It’s backwards compatible with older micro USB cords, but the included cable moves data faster and charges the removable 3200 mAh battery quicker. That battery easily got me through a full day of usage each and every day. A 13-megapixel rear sensor with LED flash resides on the back of the Note 3 while a 2 megapixel sensor handles front-facing camera duties. Here in the U.S. the Galaxy Note 3 uses a 2.3 GHz Qualcomm(s qcom) Snapdragon 800 quad-core processor with Adreno 330 graphics. Samsung combines that with 3 GB of memory and the result is an impressive, high performing phone. During my time with the handset, I didn’t experience lags of any kind. Instead, I found the phone very responsive, regardless of what tasks, or how many of them, I threw at it. Running the AnTuTu (v. 4.0.3) benchmark yielded a score of 35,957; the highest I’ve personally witnessed and about 85 percent better than last year’s Galaxy Note 2. Samsung has every type of connectivity and sensor you’d expect in a high-end phone: LTE support (my review unit uses Sprint’s(s s) network), 802.11 a/b/g/n/ac Wi-Fi, Bluetooth 4.0, NFC, GPS/GLONASS, an IR blaster, accelerometer, gyroscope, barometer and more. Also inside are either 32 or 64 GB of storage with the ability to add more through a microSD card. Of course, the standout feature is Samsung’s S-Pen and the software it uses — more on that later. The pen itself still fits into the bottom of the phone so Samsung has to keep it thin. It has a single button and metal-looking end that complements the metal-looking edge of the handset itself. I say “metal-looking” because it appears to be shiny plastic. Inside the Note 3 is a digitizer that detects the pen for inking and navigation. The Galaxy Note 3 comes with Android 4.3(s goog) right out of the box, so it runs the latest and greatest Google has to offer. And as you’d expect, Samsung’s TouchWiz software dominates the experience, just as it does on other Samsung Galaxy devices. If you’ve seen or used a Galaxy S 4, the overall experience is nearly identical; I won’t rehash all of the Samsung features from that that device — they’re here in my Galaxy S 4 review — but they all carry over to the Note 3. Action Memo. This app is like the old S-Note application on steroids. With it, you can jot down memos which can then be actionable items. For example, if write out someone’s contact information, the app is smart enough to contextually know what type of data this is. Tap the “Link to Action” button and the handwritten information is automatically populated into the phone’s contacts. Or you can write a web address down, tap a button and the browser opens to that page. Note an upcoming task and it can be added to the Task app, etc… It’s a clever method to get more value from written data. Scrapbooker. This is a handy app for collecting digital information by lasso-ing it with the pen. It doesn’t just capture a screen snip though; it captures meta-data too. For example, circling a bit of text from a web page gets not only the text, but a link to the page as well. You can organize that data with tags, memos and categories. I found it useful to create reading lists but it has many potential uses. Screen write. Tap this and the Note 3 will capture the current screen. On the screen cap you can use the pen to jot down notes, scribble some text or circle important information. That input is saved atop the screenshot, which you can then share with others. S Finder. Think of this as type of universal search app. With it you can search the web or search your phone for information. You can apply or search for information by type or by date and time because S Finder organizes your activities in these ways. Want to search just handwritten data or from the past 7 days? You can do that. Pen Window. This is an interesting way to add multitasking to the Note 3. Use the pen to draw a window on any screen and inside that window you can run one of currently seven apps in it: Calculator, Clock, YouTube, Phone, Contacts, Hangouts or a browser. The app window can be maximized or moved around as well. New to the Galaxy Note 3 is a Magazine view, which is essentially a custom version of Flipboard. Swipe up from or press the home button from the main home screen and the content rotates up from the bottom, taking up the entire screen. You can customize the various channels here and tapping a story opens it up in the standard Flipboard interface. Personally, I’d rather just use Flipboard natively or a news reader of my own choosing but the implementation here isn’t bad. Not new to the Note 3 is the multitasking or split screen mode, however it does gain some new tricks. You can run two apps at once on the screen in this mode, although not all apps are supported. Tap an arrow on the of the display and a tray of compatible apps appears; pick one and it runs simultaneously as the prior app. A nice new feature is the ability to pair apps that you use together often. Gmail and Chrome, for example, can be paired so that one tap opens both apps at once. The S-Pen now supports copy and paste from one app to the other as well. Thanks to the processor inside, the Galaxy Note 3 supports video capture up to 3840 x 2160 resolution at 30fps. You’ll need a monitor capable of UHD output to view these at full resolution of course — and these files get big quick — so most people won’t likely use the function. Full HD capture is taken at 60fps and there’s a 720p slow-motion capture at 120fps. The main sensor is backside illuminated and uses what Samsung calls Smart Stabilization. Again most of the modes from the Galaxy S 4 are used here, including Best Photo, Sound & Shot, Drama, Animated Photo, HDR and Auto to name a few. In bright light, the camera produced very good quality images for me. Move to dim or low light and the results are acceptable. The camera focuses relatively fast, particularly when capturing video. Overall, I’d say the camera is a solid but not always stellar performer. The verdict: to buy or not to buy? The first question you need to ask yourself is are you willing to pay a premium for the S-Pen features? Those are what make the Note 3 stand out from the growing pack of big-screened phones. If so, then I can easily recommend the Note 3. If not, then you’re still getting a strong performer but I’d consider looking at the other comparable devices available for less: Think the LG G2 — see our review here — the Sony(s sne) Xperia Z1 or even Samsung’s own Galaxy S 4, which delivers much of the same experience as the Note 3 in smaller, cheaper package. I still find that TouchWiz of late has gained too many functions and features that can be confusing or use resources unnecessarily: Smart pause, smart scroll, smart stay, Air view, etc… can overwhelm some. Another factor here is Samsung’s Galaxy Gear smartwatch, though. We have a review unit in house, so stay tuned, but at launch the Galaxy Note 3 is the only handset that’s compatible with the Galaxy Gear. That will change in the future, however, if you know you’re getting a Gear, the Note 3 becomes more attractive. Any improvements to S-Note? I have both a Note 2 and a Note 10.1 and I feel like S-Note is just one feature away from being my perfect solution and that is the ability to sync audio recordings to the ink like OneNote. Also, I find the inking experience on the Note 2 to be dramatically worse than the 10.1 – any improvement on the Note 3? BAD NEWS & WORD OF CAUTION! If You Were Expecting To Have Your AT&T Galaxy Note 3 shipped today, or if you were expecting to walk in on Oct. 4th, to your local retailer & walk out minutes later with what should be an incredibly awesome phone â€” DON’T!!! After preordering my Note 3 three hours after the preorder window opened on 09/09/2013, I received an E-Mail stating the phone would Ship “On or a About October 1st”. Then, a week later, I checked the status & noticed “The Estimated Ship Date is 09/11/2013 to 09/13/2013”. 2 Red Flags went up & a couple of bells & whistles. 1- Those dates had already passed. 2- I knew the phone wasn’t releasing until around 10-01. But, I called them anyway to inquire why it would show that status. As time went by, I checked periodically for updates, even called for them. Nobody could tell me why it would give the 09/11-09/13 shipping dates. But I was repeatedly assured that my phone would be shipped on 10/01, 2-Day-Air. Then I called a friend who works at an AT&T Retailer, who told me that my phone should ship 10/01, & the Note 3 would be available to the public for retail on 10/04. So Today, AT&T Release Day, by the afternoon, when I hadn’t received any confirmation or tracking E-Mail that my phone shipped, I called. After nearly 1 hour on the phone, ultimately ending up with a senior Premier Support Supervisor. Her answer â€” “Apparently AT&T hasn’t received our Shipment of Note 3’s from Samsung, & I’m showing a negative supply of -6,000 to -7,000 Units”. Bottomline, she said the AT&T Samsung Galaxy Note 3 is BACKORDERED – WITH NO ANTICIPATED ARRIVAL OR SHIPPING DATE. She said it could be “3 days, 3 weeks, or longer. I left the order in place, until I could check with the local AT&T Store. That AT&T Retail guy said “We haven’t gotten anything yet”. Now whether he just gave me some lip service because his curt answer presented a guy who didn’t wanna be there or he was tired of answering the same question a bazillion times, remains to be seen. Another thing I found curious is the fact that neither Samsung, AT&T, nor any other carrier has even remotely advertised this phone on television or in print media. That kind of preemptive strike could have swayed other iPhoner’s from picking up the 5s or 5c, in favor of the Note 3. Has anybody else experienced this shipping or supply debacle? Please let me know what you know, or what you have learned. I was in a store yesterday and they said, they’d have them today. Stopped by during lunch and they said the date was now Friday (which jives with the press releases). I asked if they had received any stock yet and they said they hadn’t received anything other than the display models. I have the Note 2. Love it. I use the pen much more than I thought I would. My problem is that I want the Note 3, but really the Note 2 is still better (for me, anyway) than even the newest phones from others,including all the Apple phones. Big stunning screen. S-pen, fast, good pen-enhanced UI. Upgrading to Note 3 would really just be an extravagance. I’m tempted though. Agree. My first touch screen phone was my iphone3g then iphone4, iphone 4s but quickly sold it and bought an Google nexus. I loved the Android experience and then bought my note 2 and it just blew my mind away. Samsung has really stepped it up on the note 3. If I was to compare the step up apple did this year on their phone Samsung blows it away. It would be the great review if you also mention that The phone come with Region Lock. .Also please do not told me to do what the Samsung say. They not know what they talking about here. USA phone can use Eu sim or EU phone can use USA sim…. I have a EU phone and i can not use it with Thai Simcard. SO if you are traveller or business guy who move around the world please be carefully. so your website can not just open the new box of the phone that come with the Sticker ? Then film it since start since open the box. then do what Samsung told you. Then put other region sim card in. Then you could be the first one who can confirm it. but do not for get to try Sim card from many region. That not sound great ? You do not have sponsor enough for just buy a 700 Euro phone for show the world ? 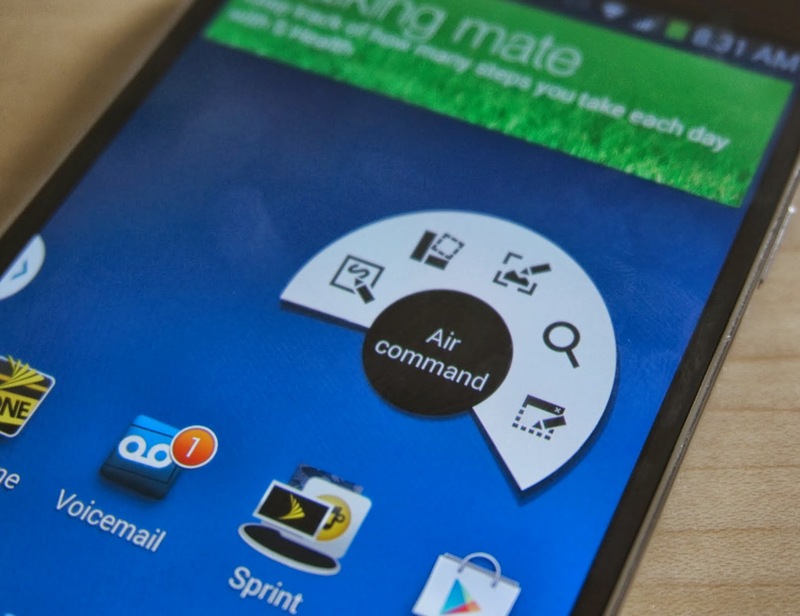 We’ve covered the SIM lock situation pretty extensively but you raise a good point. The review unit I was provided did not come in a box so I can’t verify if there is a sticker on it or what the sticker says. That not lead you to ask the question ? Why they not send the unit that really for sell to you guys ? I think some how they want to try to sneak this out from all the reviewer. My crazy idea is. Samsung told all the website spread the news about the problem is solved. By a little statement in the email but not Official Statement. You can see that all website spread this news almost same time and none of them prove it first. I think they do this for let people see about the problem is solved easy. So they would not stop buying the phone. Then you refer to Unofficial Statement. Then they would say that is just a misunderstand or that is just mistranslation. Now it too late for you. Because it more than 7 days. you can not change the phone. Do you have any feedback as yet as to whether these are ok and work abroad with local sims? The Note 3 is most likely great hardware. However, I’m bothered after reading recent reports on GigaOM about these Samsung devices which are apparently SIM locked to particular regions. I don’t want to buy any phone that is locked to a region in such a way. It’s hard to think about the other features of the phone. That’s a great point, Les. While it appears the phones are region unlocked once activated in a home region, the situation is still murky. Not just SIM locked….sim INTEGRATED too. I have a Samsung Galaxy Note 2 from Ting (which is essentially the Sprint version) and even though it has LTE, the SIM is integrated into the device which means I probably CAN’T move it to Verizon. I can tell you from my recent business trip to several countries that my N9005 was indeed region locked. My colleague from India had the N9000 which worked seamlessly. For a global traveler, connectivity is foremost, 4G and processor only come second. Also my N9005 tends to heat up a bit at times and I can see that RAM is always around 1.8gb even with minimum apps running in the background.